Valentine’s Day is almost here, and we’ve got you covered with those last-minute plans! 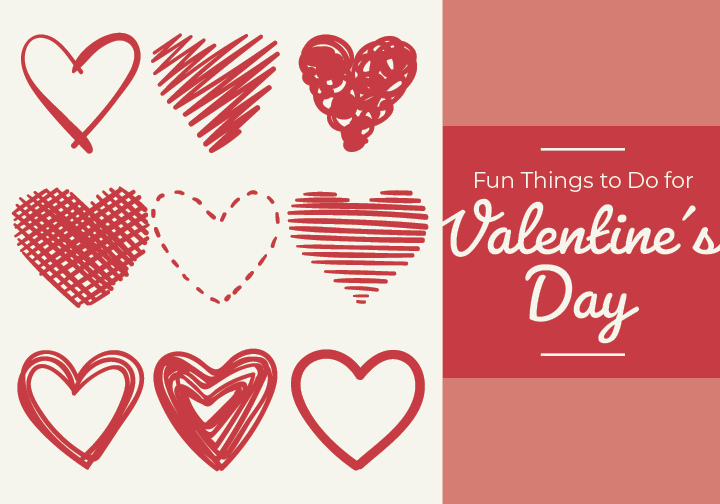 Check out these Valentine’s Day date night ideas, great for couples, friends and families in Denton, Lewisville and Highland Village! Do you want to continue the Valentine’s Day romantic dates into the weekend? Highland Village’s Date Night at Doubletree is hosting a Valentine craft night from 7 p.m. to 9 p.m. on Friday, Feb. 15. Take advantage of our Highland Village Lyft program which features a $10 discount off of Lyft rides in Highland Village and north Lewisville. The registration deadline is one week before the class starts, so make sure to plan your post-Valentine’s date in advance! The event series is for ages 21 years and older and costs $35 per couple. For more information or to buy tickets, visit https://www.highlandvillage.org/988/Date-Night-at-Doubletree. NOTE: Our Highland Village Lyft service ends at 9 p.m., so please make sure to prepare your travel in advance. Can’t wait for the weekend to celebrate your love? Head to Painting with a Twist in Denton! They have Valentine’s Day themed canvases from Thursday, Feb. 14 through Saturday, Feb. 16. Age restrictions vary per class so make sure to read the “about this event” section. Hop on Denton Connect Route 7 and you’ll be on your way! To reserve your seat, visit https://www.paintingwithatwist.com/studio/denton/calendar/. Date night out for parents can be hard to come by so leave the planning to the city of Lewisville! Go all out at their Valentine’s Day Dinner from 7:00 p.m. to 9:00 p.m. on Feb. 14. Dinner is $75/ person and includes not only a four-course meal but also wine pairings and chocolate covered strawberries! The Old Town Wine House is a short walk from the A-train station in downtown Lewisville. To reserve your seat, visit https://www.visitlewisville.com/Home/Components/Calendar/Event/31877/974. Couples that break stuff together stay together. That’s how the saying goes, right? Grab that special someone or maybe a few friends and head to The Breakroom in Denton on Friday, Feb. 15 through Saturday, Feb. 16 and enjoy letting go of all that Valentine’s Day stress by smashing stuff! Time slots are available all weekend so hop on Denton Connect Route 8. Psst… sometimes you can find coupons on Groupon! Sign up at https://www.thebreakroomdenton.com/. Head to Highland Village for Seussical the Musical Jr. starting at 7:30 p.m. on Friday, Feb. 15 and Saturday, Feb. 16. This family-friendly event transports you into the world of Horton and the Whos ‑ perfect for all ages! Adult tickets are $15 each and $10 for children 10 and under. Take advantage of our Highland Village Lyft program which features a $10 discount off of Lyft rides in Highland Village and north Lewisville. For tickets, visit http://www.studiobtheater.com/. NOTE: Highland Village Lyft service ends at 9 p.m., so please make sure to prepare your travel in advance. Let us know in the comment section below which events you plan on attending while you #RideDCTA in celebration of Valentine’s Day!